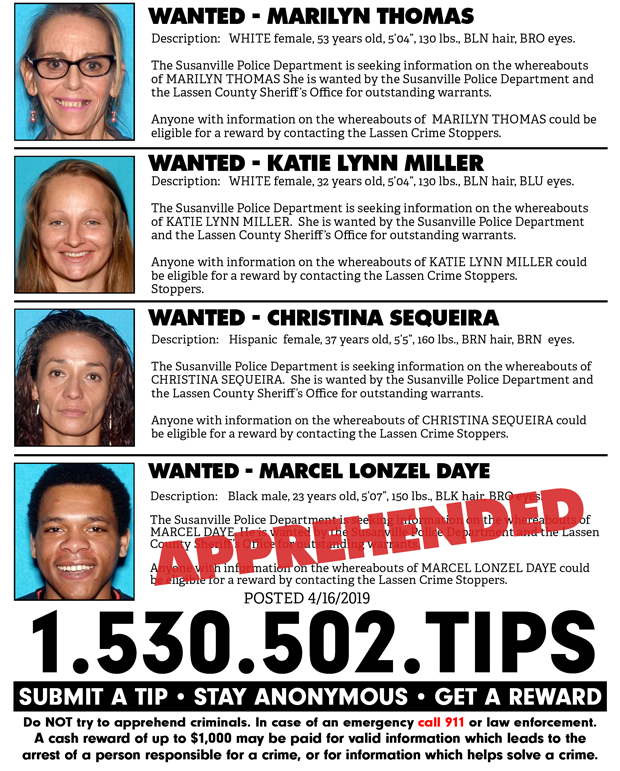 Lassen Crime Stoppers, a local organization which pays up to $1,000 for tips and information leading to the arrest of someone who commits a crime, has released this week’s list of names and photos of subjects ‘wanted’ by local law enforcement agencies. To report information about a crime you can anonymously call a simple telephone number, (530) 502-TIPS, and if that information pays off for local law enforcement you will be paid up to $1,000 in cash. To download a printable version of this week’s Crime Stoppers’ Flyer click here. Help clean up Lassen County by anonymously working with the Susanville Police Department and the Lassen County Sheriff’s Office through Crime Stoppers. Posted by Jeremy on . Filed under Local & Regional News. You can follow any responses to this entry through the RSS 2.0. Responses are currently closed, but you can trackback from your own site.